Partisans is that rare thing in jazz, a long-running band with an unchanged line-up. Now nearly 20 years into their development as a unit, the group joined Brandon Allen’s 2015 Highgate Jazz with Soul festival on a damp bank holiday Monday afternoon. The atmosphere seemed initially to dampen the music, but the select audience were well warmed up by the end of the set. Guitarist Phil Robson seemed to sense that things were running on tick-over when he announced after a couple of numbers that we were getting the ‘laid-back version’. Playing with a sliced fingernail gained while over-enthusiastically bending strings at the previous evening’s performance, his caution was understandable, and his confidence audibly grew as the set continued. Most of the tunes were taken from Partisans’ latest Parliamentary Jazz Award-winning CD Swamp, marked by the group’s great variety of beats, feels and grooves. Tenor/soprano sax player Julian Siegel took his share of the announcing as well as the soloing, playing with his customary imagination and verve. He also took a couple of turns on bass clarinet (known as ‘the goose’ to the rest of the band, apparently), notably on Thin Man which took off in a 12/8 feel, leading into unison theme. Many of the numbers featured this device, and it took a dive back in time to the 2000 track Sourpuss to get some nice counterpoint going in the front line. By this time Robson seemed recovered from his earlier tentative form, with a storming guitar solo. With plenty happening on guitar and saxophone, it might be easy to overlook the back line. No such chance here, with drummer Gene Calderazzo fizzing along in his exuberant style. For me, the discovery of the gig was Thaddeus Kelly on bass guitar – he plays a full and utterly solid role, with a unique playing style involving three totally straight and unbending fingers on his left hand. This might look like a drawback, but Kelly rolls up and down the fingerboard without a care in the world, magicing the notes from nowhere. The standout number was the closing Overview, imagined in response to an astronaut’s angle on the Earth from above. A lilting 3/2 figure on bass ushered in the band, leading to Siegel’s soprano solo, before launching into 4/4 for the Robson to launch his contribution. As the sounds faded away, an eerie radio whistling emerged (Kelly twiddling some unseen knobs to vary the pitch) to end… but it wasn’t the end at all, the opening figure emerged again for a final theme. Marvellously imaginative music. 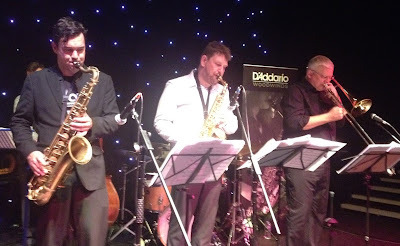 The fifth edition of Brandon Allen’s Highgate Jazz with Soul Festival concluded with the organiser’s own sextet making a rare outing. It must take a bit of diary negotiating to get alto sax virtuoso Nigel Hitchcock and top session drummer Ian Thomas in the same room, but the results were well worth waiting for. Many musicians would respond to the opportunity of their own band by starting to write original material to foist onto the unsuspecting public. Allen has taken another route by putting his effort into producing wonderful arrangements to showcase the richness of the writing and the skill of his performers. The result is nothing less than a six-person big band – an extraordinary achievement. The front line of Allen’s tenor sax, Hitchcock’s alto and the trombone of Mark Nightingale produce lush and rich harmonies that seem to come from a much larger unit. The band’s material is pretty much as classic as it comes, with some real all-time classics in the opening sequence (Stardust, Black & Tan Fantasy, Melancholy Baby, Prelude to a Kiss), which in lesser hands might be a bit predictable. Allen’s arranging powers took these tunes to another level, with lots of interesting syncopated sequences which still left plenty of room for solos. Pianist Tim Lapthorn had plenty to do, both in keeping up and in plenty of solo space, while the three horns all took their opportunities to shine – Allen being particularly effective on Black & Tan Fantasy. Sam Burgess showed his bass skill on Prelude. Abigail Boyd joined for a short vocal feature on the last two of these classics, adding again to the variety on offer. We were close to the interval when the first post-war tune appeared – George Russell’s Ezz-thetic, which showed a different side to Allen’s arranging skills. The band were tight as anything through the arranged passages, with Thomas’ ability to read a drum part showing in his inch-perfect hits and phrases. Limehouse Blues taken at breakneck speed showed another snappy arrangement and gave Hitchcock a chance to spread out – always a treat. A delicious reworking of Joe Zawinul’s Young and Fine showed more of Allen’s fine choice of material, showcasing once again the fine ensemble work of the musicians. A rollicking run at Charles Mingus’ Boogie Stop Shuffle brought the performance, and the festival, to a close. Brandon was visibly moved as he carefully thanked all the festival helpers and supporters – many of whom were also close friends. Even with the slimmed down format and using one venue for each of the three days, organising the event had clearly taken a personal toll. It’s not easy running a showcase for London jazz on a holiday weekend when many people will be out of town. I hope that way can be found for this splendid event to continue to a sixth edition in a way which is both manageable and viable for all concerned. Bravo Brandon!